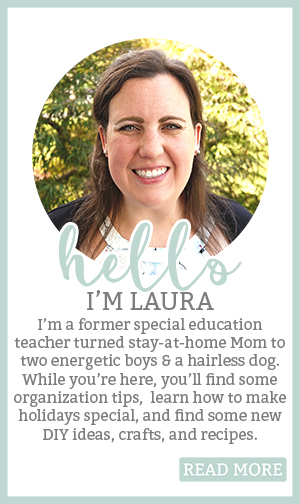 Last week I gave a little sneak peek on Instagram for today’s post. 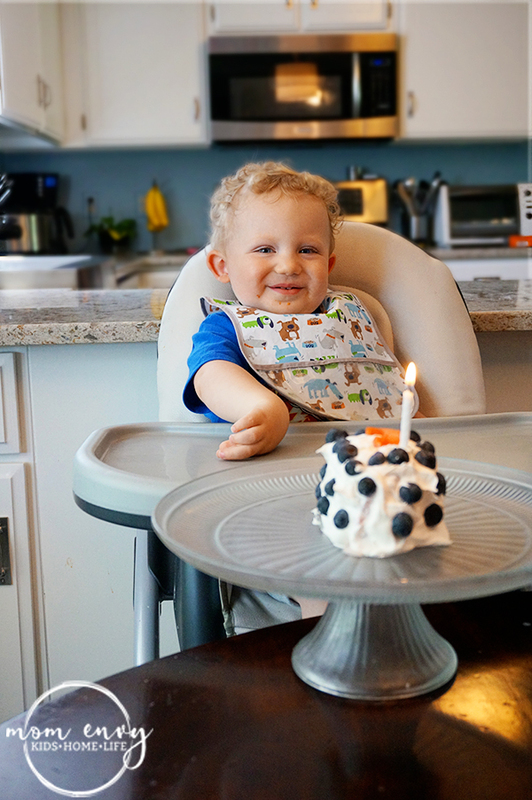 We celebrated Carl’s half-birthday (yes, my husband and I am crazy and celebrate every little thing). Since Carl’s birthday falls so close to Christmas, I told my husband that I wanted to celebrate his half-birthday as a tradition. No toys or parties, just a small special dinner or dessert to celebrate. 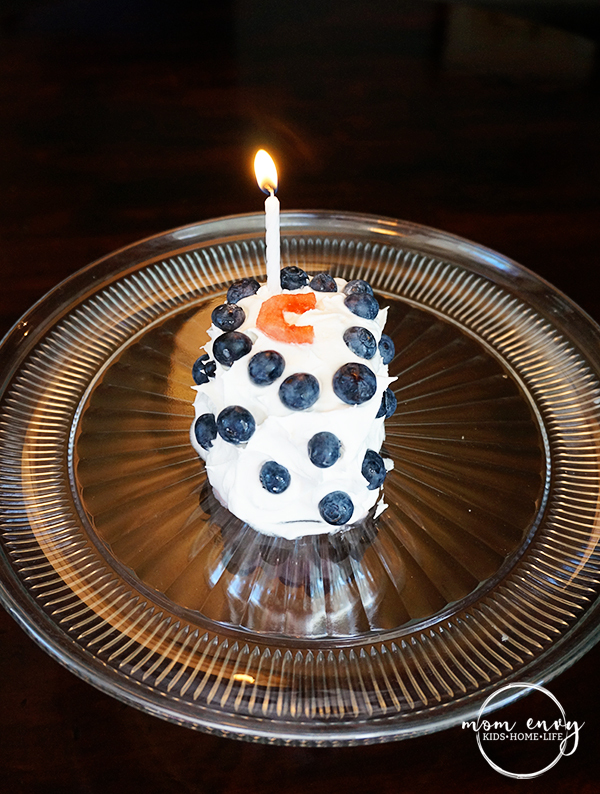 For his celebration this year, I decided to make him an adorable little cake. 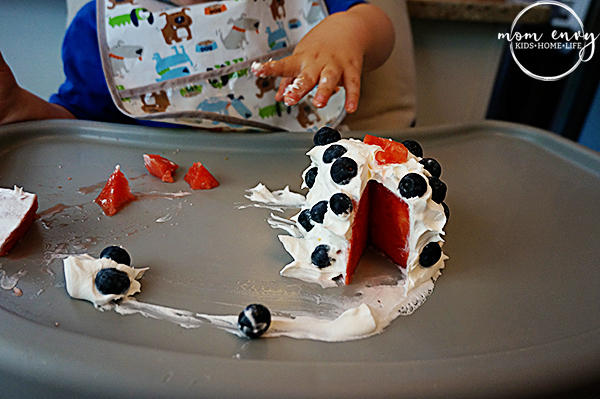 I wanted to make him something healthier than a real cake. So I decided to make it out of his favorite food: watermelon. If you haven’t read already, Carl is obsessed with watermelon. We have to hide the bowl in the back of the fridge because if he sees it and can’t have it, he goes nuts. You know exactly what I am talking about – the falling to the ground kicking and screaming like we told him he could never eat another bite of watermelon again – kind of nuts. This is how crazy I am about celebrations. Below is Carl with his messy chocolate half-cake from last year (ignore the semi-painted wall). The funny part is that we didn’t even let him taste it (he didn’t have his first table food until the day we made this. We didn’t think chocolate would be the best first food). So we were mean and made him take a picture with a cake he wasn’t allowed to eat. And then we ate it in front of him. We were really winning as parents that day. 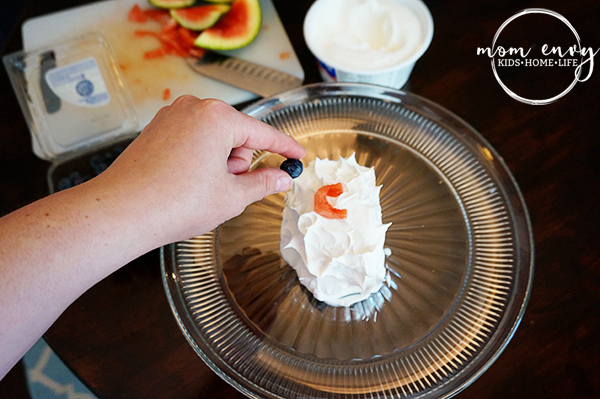 Here’s a quick little video to show you just how easy this cake is to make. Now I am calling this a recipe but in all honesty it is so simple that it doesn’t exactly qualify as a recipe. 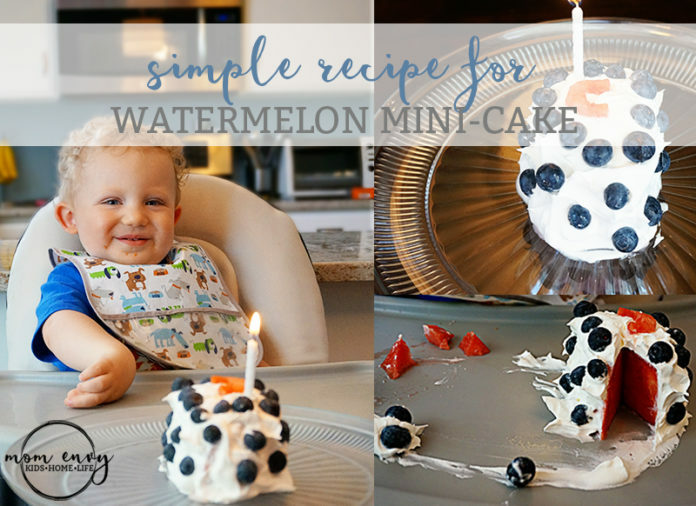 What kid wouldn’t want to eat such a cute little cake? 1. 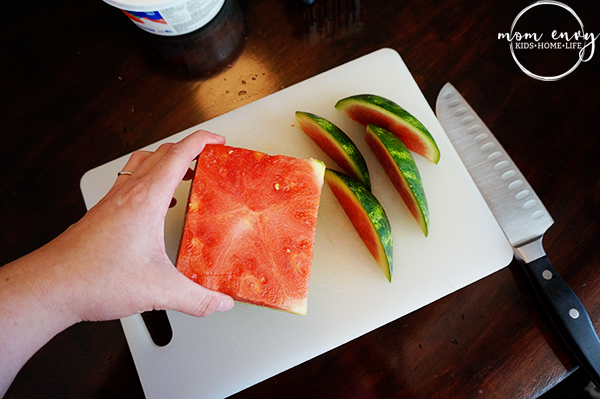 Cut the watermelon in half. Then cut off the rounded ends to create a square-like shape. 2. 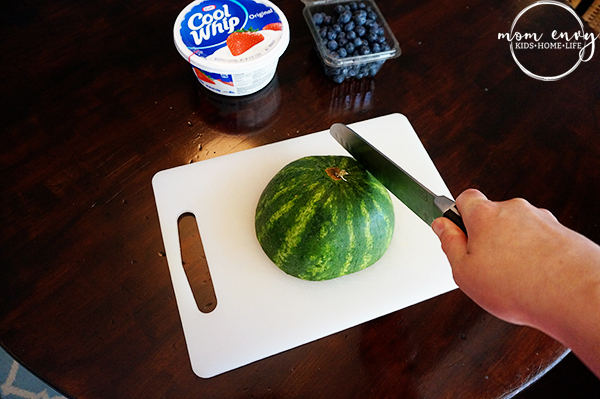 Carve the skin off the watermelon. 3. Cut off a thin layer of the top to make it flat. 4. 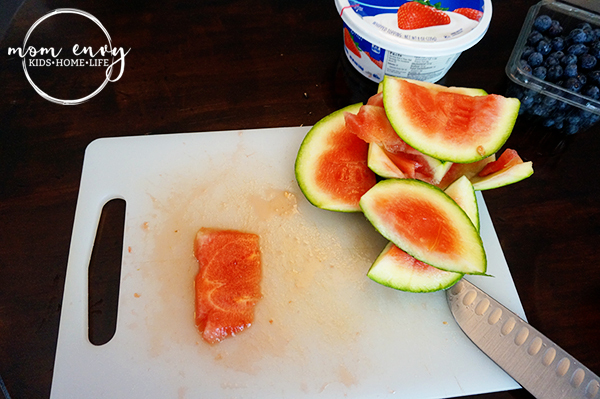 Cut the watermelon into your desired shape. For the first birthday, I cut the watermelon into a circle shape. For Carl’s, I cut it into a half-circle (for his 1/2 birthday of course). If desired, you can round off the edges of the top of the watermelon like I did below (I didn’t do this for the 1st birthday cake but thought I’d try it for Carl’s. I like both methods). 5. 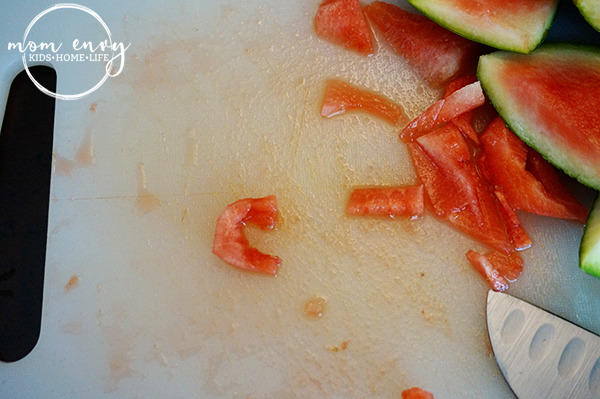 Place the watermelon on the dish you want to serve it on. It is not easy to move afterwards. 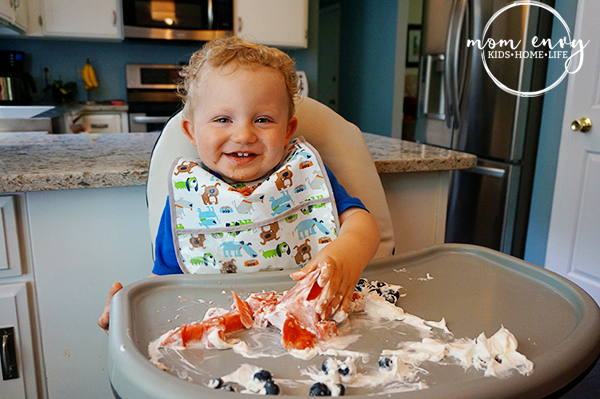 You will make a giant mess if you try – trust me. 6. 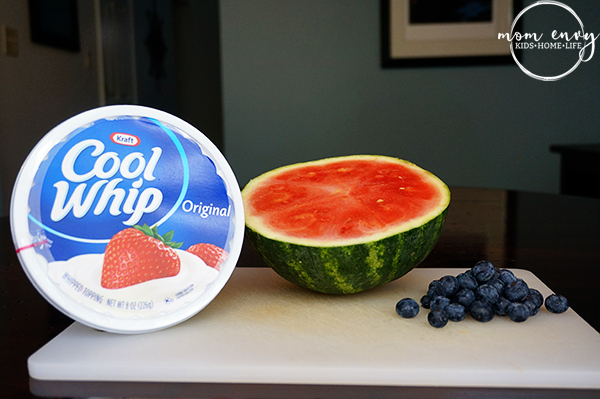 Plop a giant spoonful of cool whip on the top of the watermelon. 7. 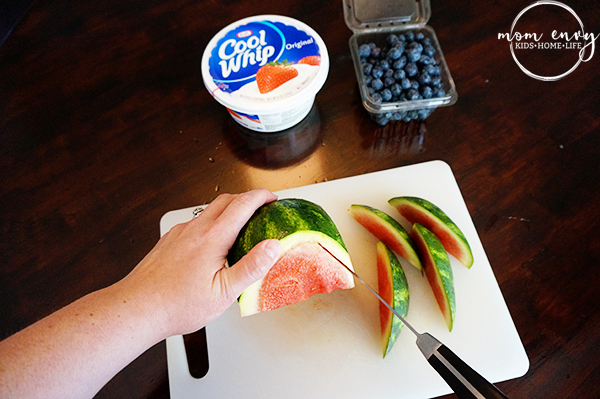 Spread the cool whip out towards the sides and down. 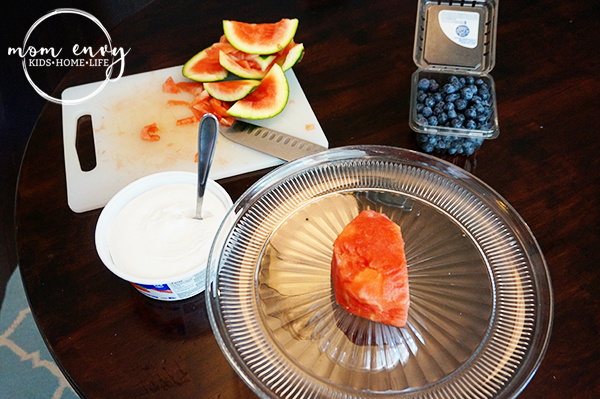 It is easier to place a giant spoonful on top and then spread out and down rather than trying to “ice” the sides (because of the slipperiness of the watermelon). 8. 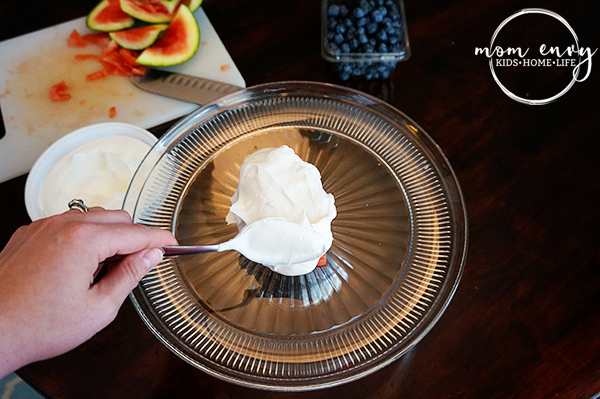 To create the porcupine effect, place our spoon gently onto the cool whip and gently pull the spoon away. 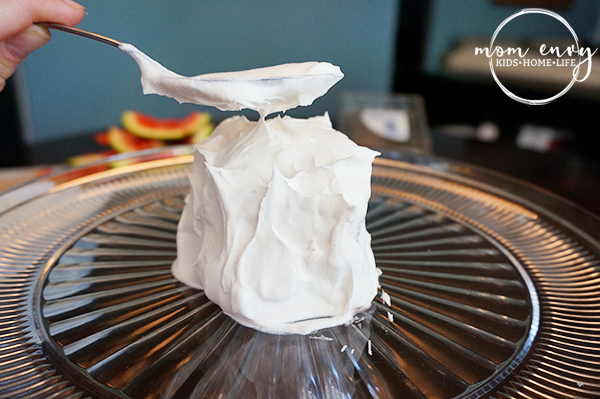 This will drag the cool whip with the spoon creating small peaks. 9. Then it’s time to decorate. I wanted to place a C for Carl on his cake. I used the thin slice of watermelon I had cut off earlier. 10. I cut a small C using the tip of my knife (you could also use cookie cutters). 11. 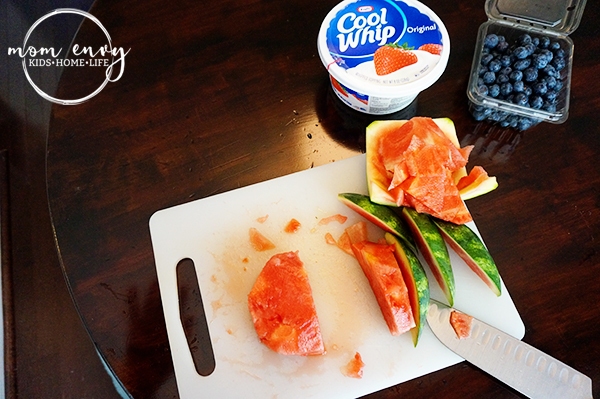 Then decorate with fruit. I placed blueberries all over the cake. *Note: This is not a cake that can be made way in advance because the watermelon and cool whip create a watery mess. I made this a couple hours before I wanted to serve it and kept it in my fridge. It held up for a few hours just fine but I wouldn’t go longer than that. 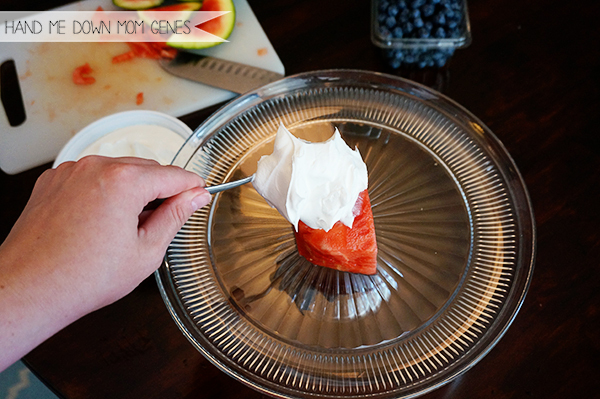 I love watermelon with cool whip. This is a great idea!! Oh my goodness! That is the cutest idea! 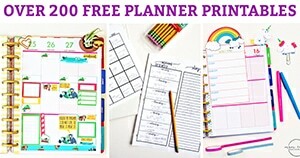 I pinned it to our Bloggers Brags Weekly Pinterest Party Pinterest Board. 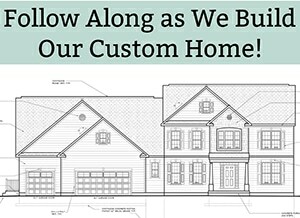 Thanks for sharing your awesome post with us! Thanks Misty! 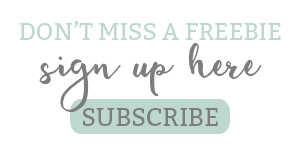 Thanks for co-hosting a great blog hop!